Our Cannonball Blaster is a hit at any event. This thing is FUN! I don't think there is any better way to make 4 people smile and laugh like putting them in our inflatable Cannonball Blaster. We know what you're thinking. Are the balls too soft , too hard? We thought the same thing, so we made sure they were just right. (We provide safety goggles too). 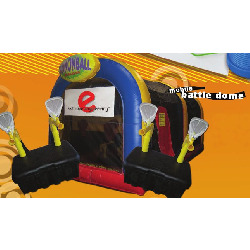 There's only one thing left to say about it: 100 foam balls, 4 people, overhead and blaster mounted targets, and an inflatable arena. It doesn't get any better than this. 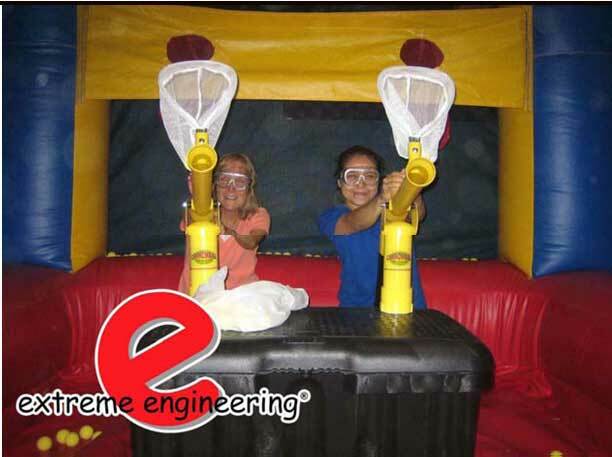 Although, usually kids will have more fun shooting at each other than the inflatable arena or cannonball blaster mounted targets. We can't fault them for this. It's what we do too. Have you ever heard that big things come in small packages? The Cannonball Blaster reflects this saying very well. Some might be unimpressed with the size of the unit when they see it, but let me tell you, every one that takes a turn in the Cannonball Blaster knows it is big time fun. I would say that one of the best parts about this interactive inflatable game is that it is smaller. Because of it’s size, we can often get it inside smaller locations without issue. You will not be disappointed!